Since Zaragoza is only 45 minutes from Huesca, it’s the closest city to where David’s parent’s live. It also happens to be the pass-through for all transit, so when we arrive, the train from Madrid stops in Zaragoza. 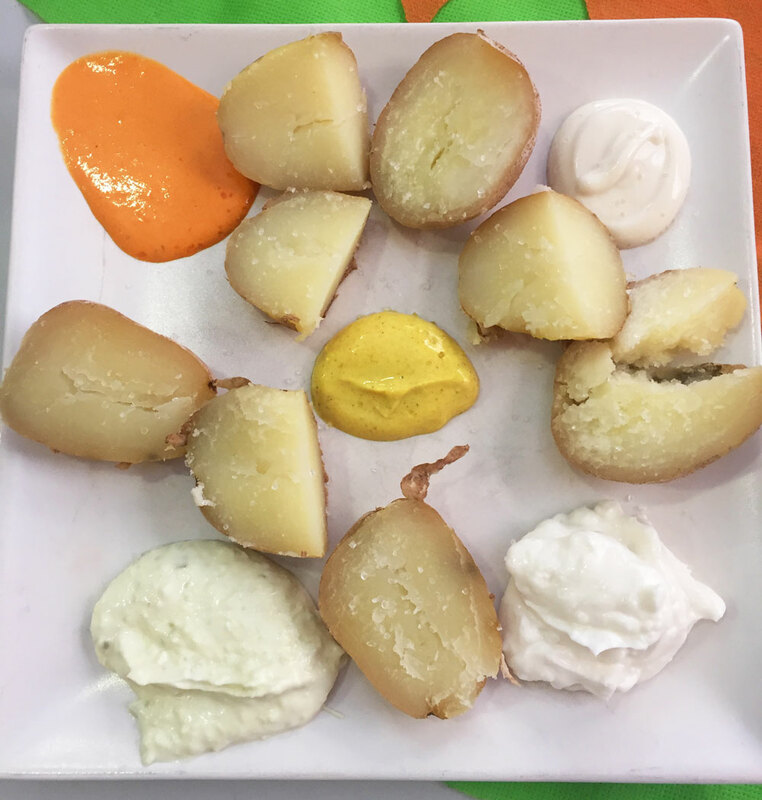 If anyone is traveling to northern Spain, chances are that you’ll find yourselves in Zaragoza at some point, so here are some vegan-friendly places you can check out while you’re there. 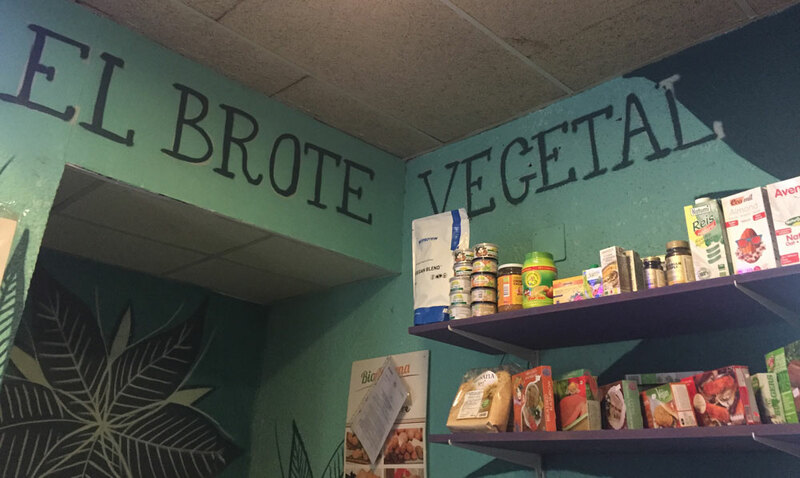 It might seem odd that this place has 2 names, but I think Birosta is just what they call the restaurant portion (in the back), and El Brote is what they call the bar/cafe/mini market (in the front). 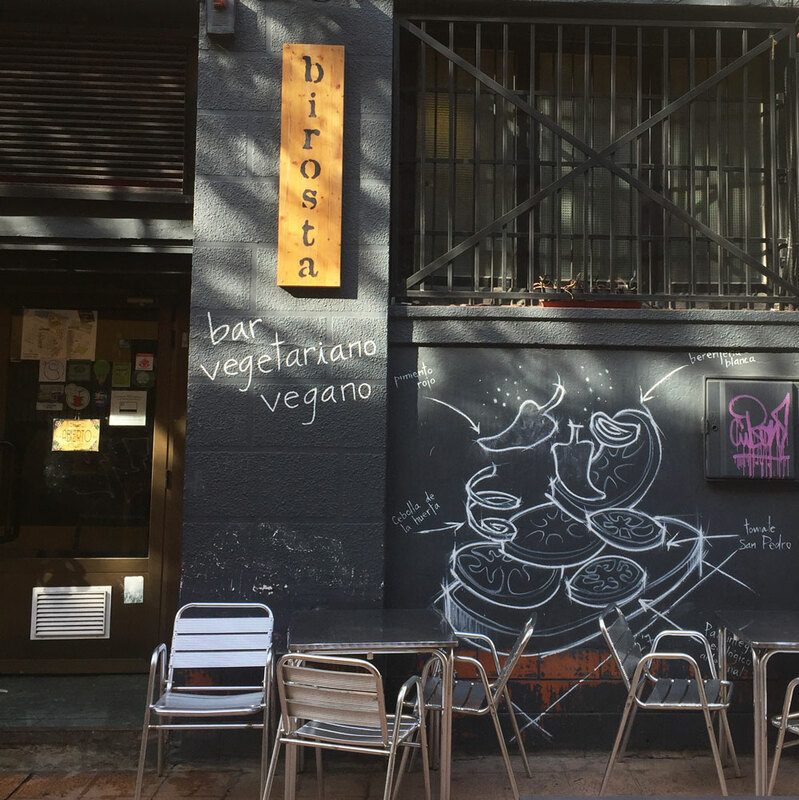 I didn’t actually eat at Birosta, so I can’t share anything about the menu, but there are some reviews on Happy Cow, and it sounds like it’s vegetarian with vegan options. The outside calls the place Birosta, and it’s actually quite easy to find. 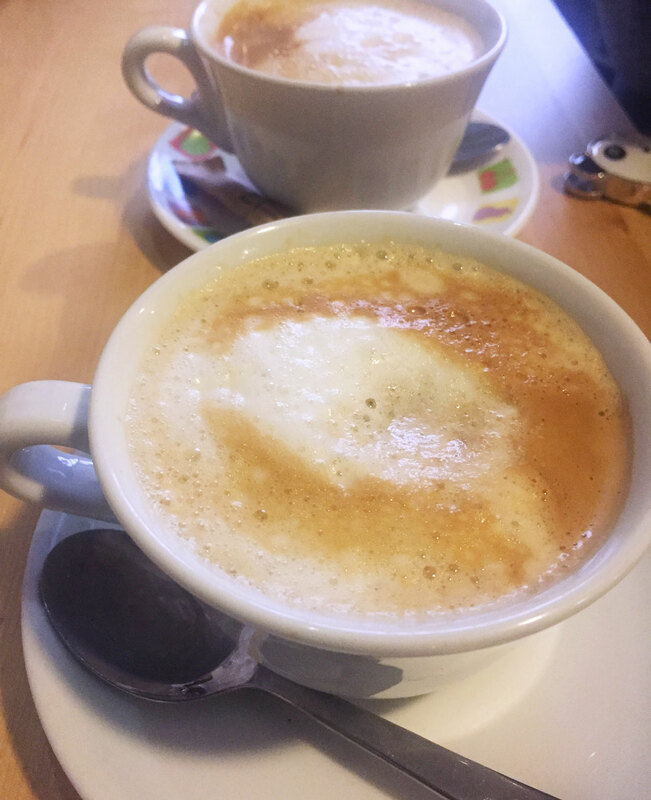 I visited El Brote and ordered cafe con leche de soja (which is spanish for soy latte). They’re smaller than the lattes you get in the states, closer to cappuccino-sized, but they were very tasty. 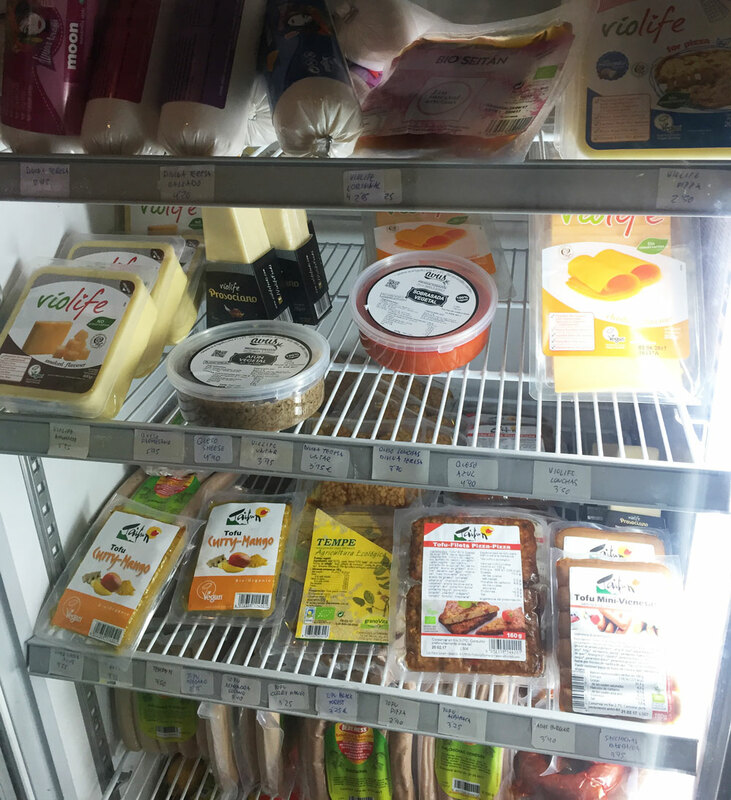 The mini market has only a small fridge, but it’s quite inclusive and has such a wide variety that I purchased 5 things to take home: violife cheese, soyrizo, 2 kinds of flavored baked tofu, and some sobrasada vegetal (that red stuff that’s in a hummus-sized container). I wouldn’t have known what sobrasada vegetal was, but David taught me that in Spain, the equivalent to peanut butter and jelly sandwiches (because they don’t have peanut butter in Spain) is a sandwich made with cheese and this spread. 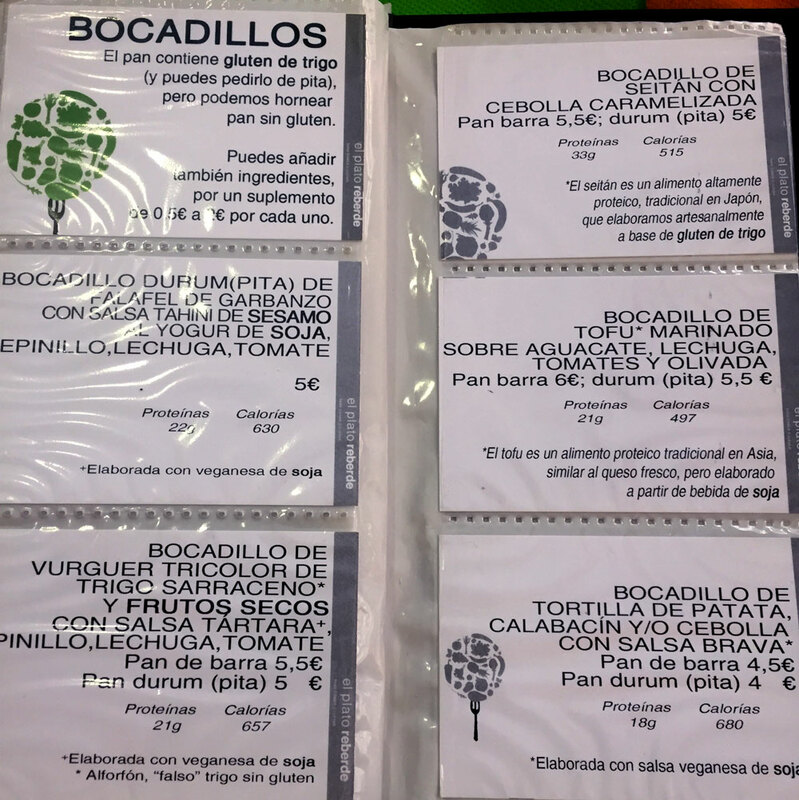 So, when we got back to Huesca after a day in Zaragoza, we made grilled cheese and sobrasada vegetal sandwiches, and OMG, was it good. It made me wish I had been a kid growing up in Spain, except that my mom probably would’ve made mine with non-vegan cheese, so I guess I’ll just make up for lost time by eating as much of it as I can before I head back to the states. 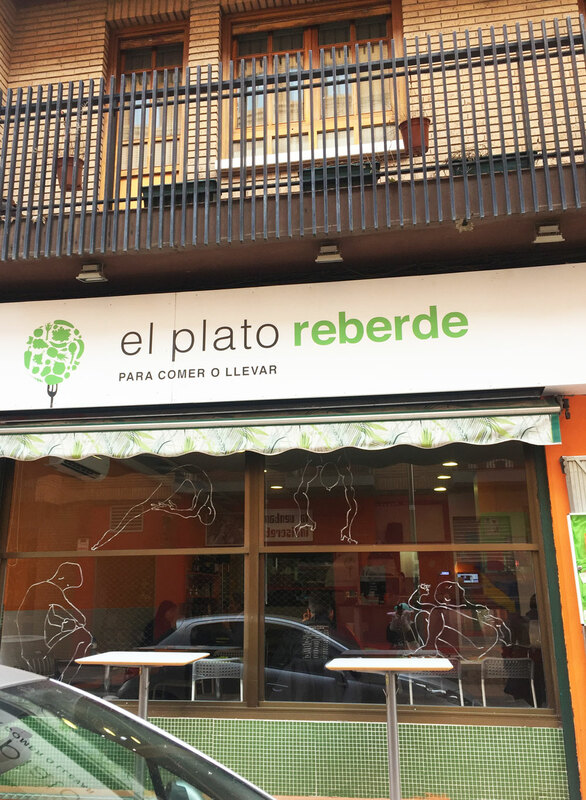 They didn’t have wifi, so we didn’t stay long, but I would definitely recommend this place to any vegans passing through Zaragoza. 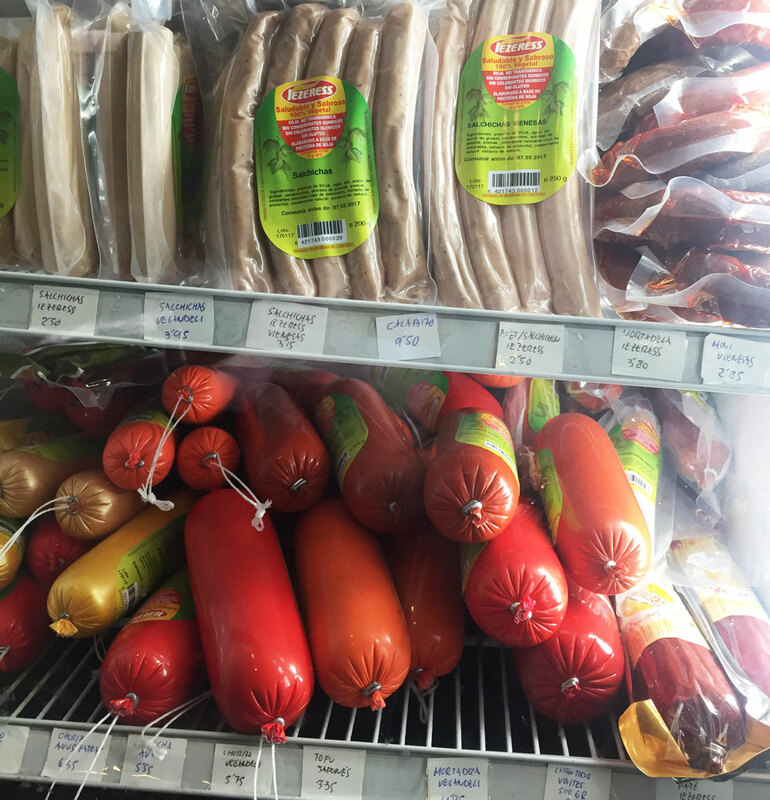 I was super excited to find an all-vegan establishment in this area of the country. If you like taking pictures of your food, request a table by the window in the front so you can take advantage of the natural light. Warning: The menu is entirely in Spanish, so if you’re not bilingual (or you don’t travel with a bilingual partner like I do), you may need to request the wifi password before ordering so you can access google translate on your phone. We started with an appetizer that came with baked potatoes and 5 different dips. I assumed this would be like oven-baked fries, but when it came out, it was actually just baked potatoes, cut in half, and sprinkled with salt. One of our 3 baby potatoes had a bad spot on it, so that showed lack of attention to detail in my eyes. However, one of the sauces was a tartar sauce, and it was SO GOOD. 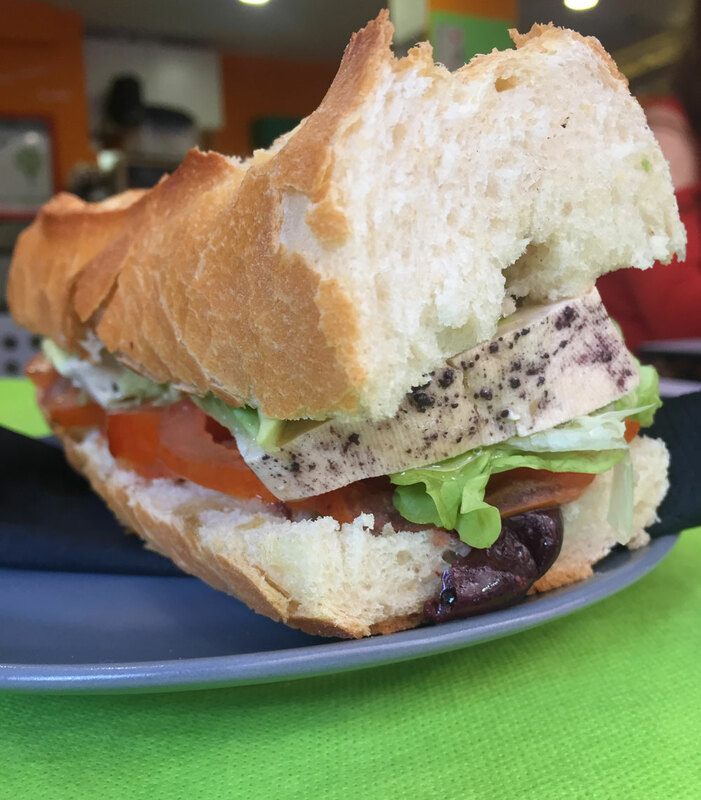 I ordered a sandwich with marinated tofu, lettuce, tomato, avocado, and olives. The sandwich was enormous! It was definitely a good deal at 6 euros since it ended up being 2 meals. The problems with the sandwich were that it came out dry with zero condiments and the tofu tasted really plain. I guess it’s a spanish thing to serve dry sandwiches with no condiments or sauces, but I was very much not expecting it. I live in the SF bay area where we have places like Ike’s and Butcher’s Son that serve sandwiches so messy that you needed a stack of napkins to eat them. I like my sandwiches very flavorful. It might have been this lack of sauce that really accentuated the fact that the “marinated” tofu was hardly marinated at all. It tasted like someone opened a package of tofu, squeezed some lemon on it, and charred it for a few minutes. Not good. My partner ordered a stew. I didn’t take a photo, because it didn’t look appetizing at all, but I tasted some of the sauce, and it had a lot of flavor. If you go here, I recommend avoiding the tofu sandwich and ordering the stew instead. Luckily, the service was good, and they had wifi, so it made for a pleasant experience nonetheless. Warning: It’s not easy to find parking near here, so take that into consideration when planning your visit. The decor in this place is super cute! 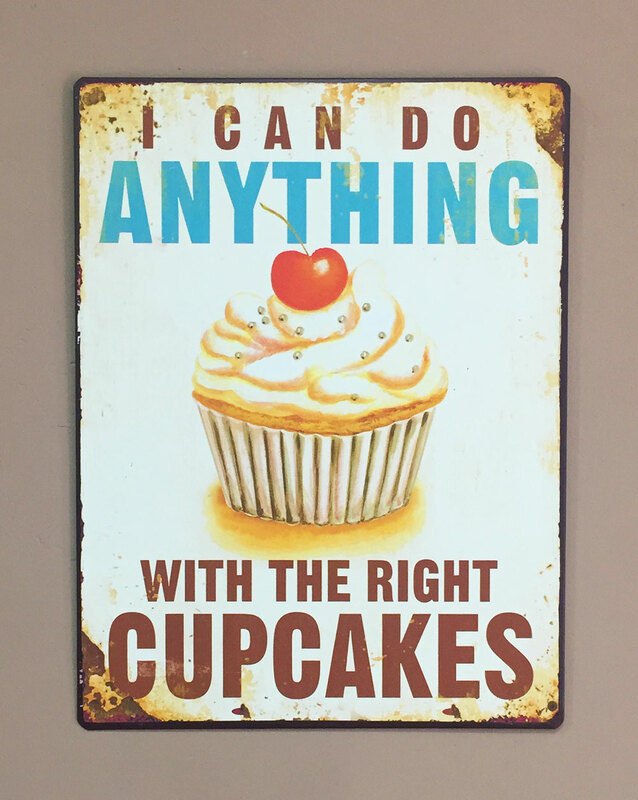 I think I even spotted a unicorn poster in the back kitchen area. I wish I could’ve stayed and enjoyed the ambience longer, but they were closing when I arrived so I had to order and run. I’m hoping it was the we’re-about-to-close-for-the-afternoon panic that caused the staff’s rudeness, so that nobody else has to experience being treated like a child when they go there. 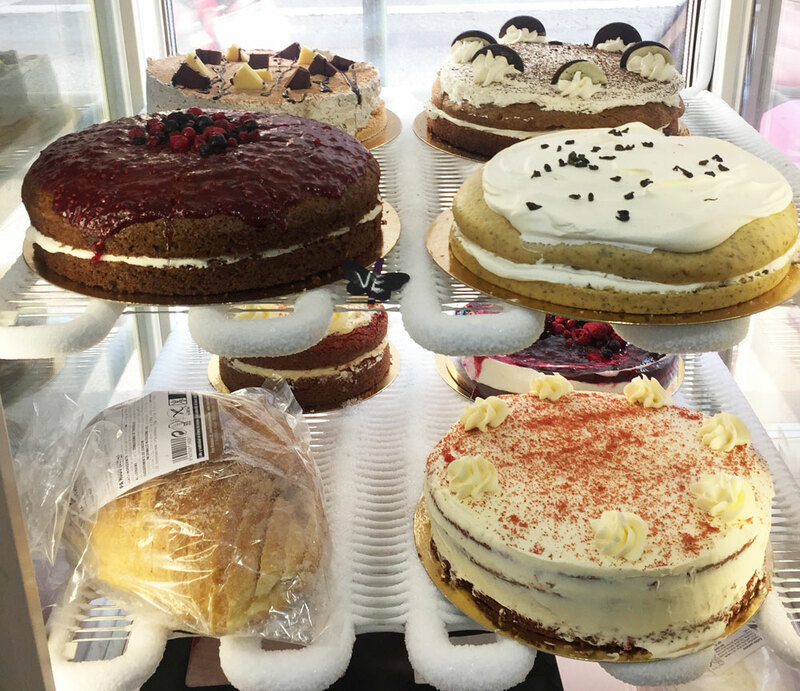 But I didn’t let it get me down, because VEGAN DESSERTS! There was a good variety of vegan things: 1-2 cookies, a tart, and a cupcake. I of course ordered one of each because I’m kind of (okay fine, completely and totally) a sweets addict. The cookie was chocolate with chocolate chips, and sadly it tasted a bit too healthy for my taste. I’m not into places that offer a vegan option that’s always void of salt or sugar or anything delicious because they think vegans just eat celery (don’t get me wrong, I do love a good stalk of celery). The cookie was too hard, dry, and not sweet enough. The cupcake was a carrot cupcake, which is one of my favorite flavors! Sadly, it tasted hard and dry. 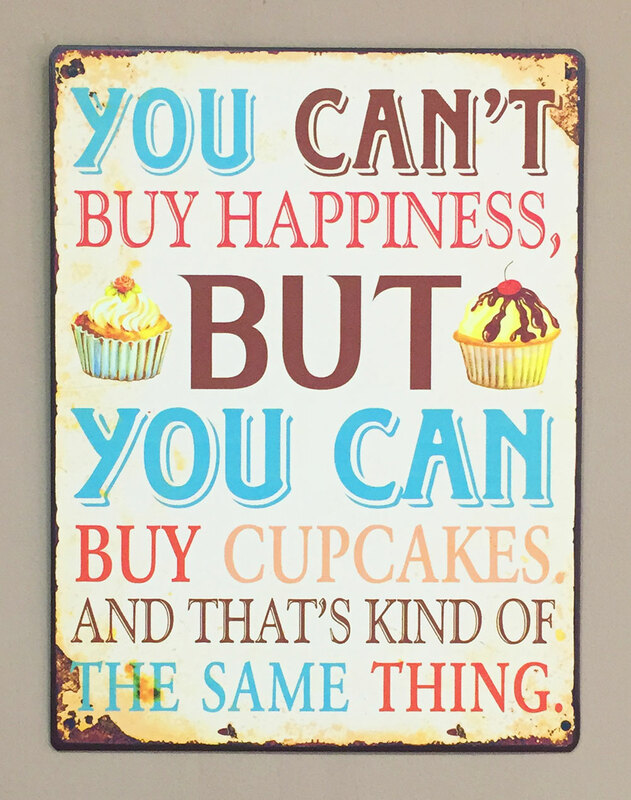 It tasted the way my cupcakes taste after 3 days of sitting out. When I go to a grocery store, I expect to maybe not get the freshest baked goods, but this was a bakery! They specialize in baked goods! Why would they sell us something that was 3 days old without a warning? And not only that, but they tried to upsell us a second one! We ordered only one, because we were already ordering numerous other things, and the guy told us that he had another one if we wanted it. He was trying to get us to buy not one, but 2 of his 3-day old cupcakes at full-price! WTF! The vegan apple tart was surprisingly good! 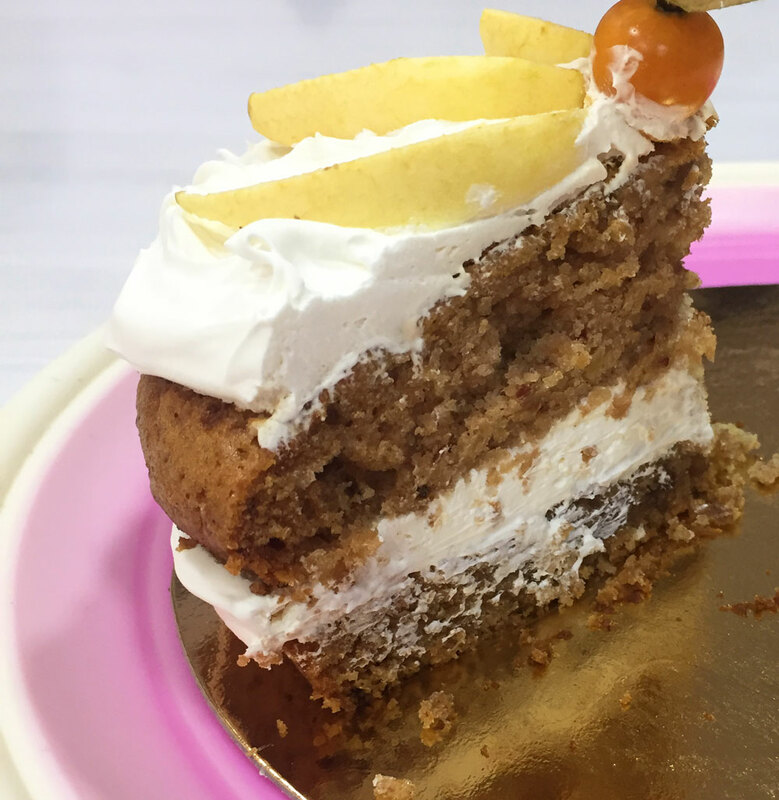 It was moist, the whipped topping was delicious, and I would recommend it to anyone visiting Zaragoza. 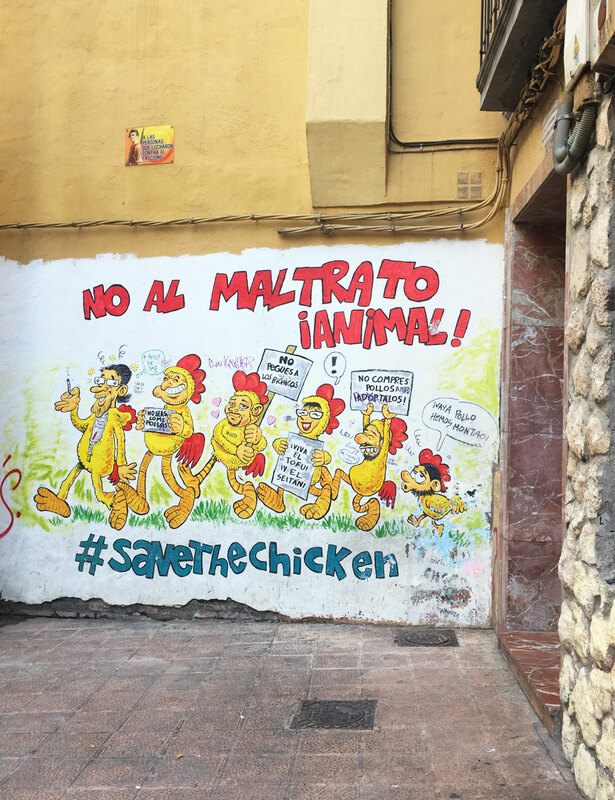 While walking through the Magdalena neighborhood (spanish for muffin! how cute is that?! 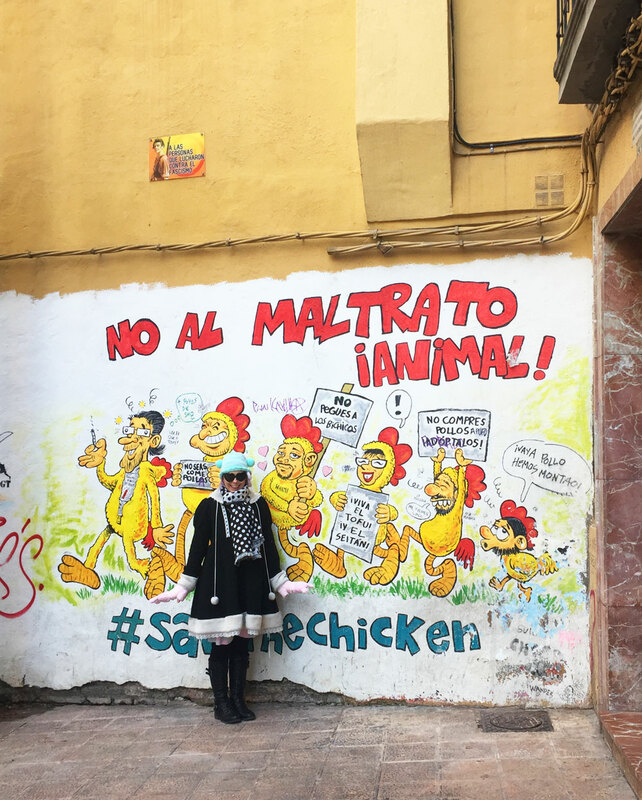 ), I spotted this animal rights mural that says “No to Animal Abuse” and “#savethechicken”. If I had any artistic talent at all, I would organize fun vegan street art painting days with friends. It’s such a cute idea, and it made me so happy to see it. Those are the only places I went in Zaragoza. There are quite a few other places listed on Happy Cow so check those out too. And remember that before you go to any places in Spain, check the hours before you go (since most places close for a few hours between lunch and dinner). I added the hours for most of the places I went on Happy Cow and Yelp.